"Shortly after the incorporation of the town, the town of Reading recorded their first 'bucket brigades' in the 1660s. The first engine was put into service in the early 1800s and was known as the 'Republican Extinguisher'. It was housed in a small building located on the ancient burial ground near the common. This equipment was manned by volunteers for over 25 years until the 'Black Hawk,' a tub was put into commission for the next 26 years until 1852. 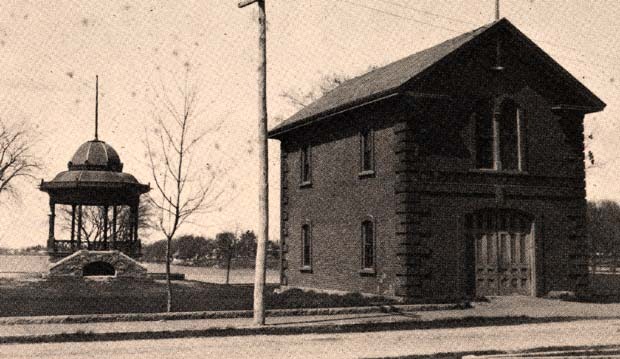 In 1854, the first official fire department in the town was established through an act of the legislature. Volunteers continued to man the equipment since the permanent firefighter was not hired until 1989. In 1882, a volunteer organization, known as the Home Fire Protection Association, was formed by Rufus Kendrick. A staunch supporter of small fire apparatus, Mr. Kendrick believed in using buckets, cans, garden hoses attached to houses and particularly Johnson hand force pumps. Because of his involvement, the town at one point had 450 Johnson hand force pumps, 300 of which were owned by private individuals, and 150 by the town. Born on March 27, 1822 and raised on a farm in Amherst, NH, Rufus Kendrick first became interested in in fighting fires with small apparatus as a young boy. He often saw fires extinguished with the use of wet mops and buckets of water, saving farm houses from devastation. His interest never faltered and after moving to Cambridgeport he continued to go to fires with his own pumps and at one time he had the pump turned on him by a firefighter. He was a resident of Reading for a short time and later moved to Wakefield where he lived in the Greenwood section. During his residence in Wakefield, he spent several hundred dollars of his own money to promote volunteer fire fighting with the Johnson pump. He was looked upon with scorn by some, but was nevertheless responsible for saving thousands of dollars for the town. Membership in the Home Fire Protection Association required that each member sign an agreement to use the pump at;Captions: 1. 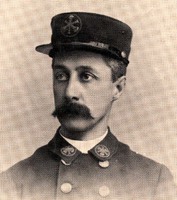 William E. Cade, Chief Engineer of the Wakefield Fire Department and a member of the Fountain Engine Company. -- 2. Volunteer Hose Members: Zwicker, Russell, White, Cicle, Kent, Pope. -- 3. 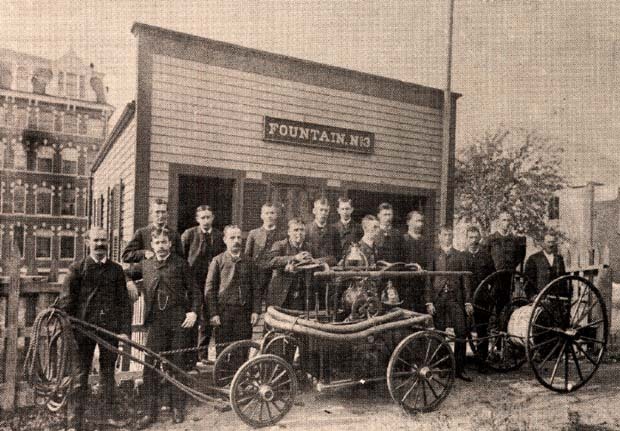 Fountain Number 3 crew at the headquarters on Crescent Street. -- 4. Brick fire station on Church Street built in 1860. This picture was taken after 1884. Photos courtesy of the Payro family, Louis Picardi and the Wakefield Historical Society. 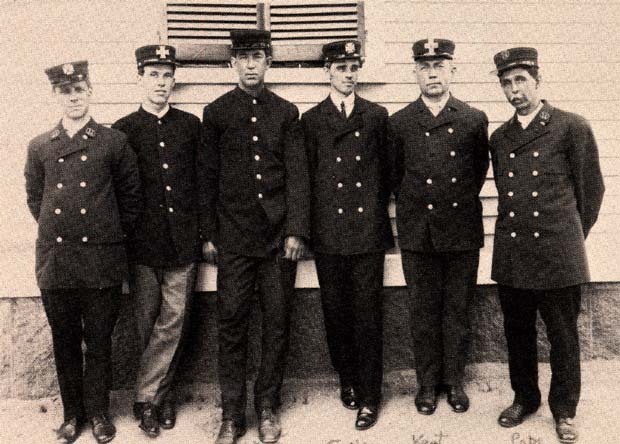 “Fire Department and the volunteers,” NOBLE Digital Heritage, accessed April 22, 2019, https://digitalheritage.noblenet.org/noble/items/show/6939.